The three veterinarians at All Creatures Great and Small, Dr. Sabra Thomas, Dr. Justin Vaughn and Dr. Jessica Bailes, work with support staff members who are cross trained as receptionists and veterinary technicians/assistants. You will be seeing the same people every time you come in our doors and talking to the same people every time you call the clinic. We all participate in making your pet’s visit to our facility as stress-free and safe as possible. All staff members participate in ongoing education and have differing areas of expertise. And of course we cannot forget about our “greeters” – Vladimir and Sunshine, who are ready and willing to address your every need!! 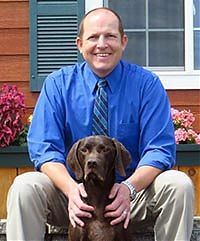 Dr. Thomas graduated from Oregon State University with a Doctor of Veterinary Medicine degree in 1997. She has worked as a vet in the Corvallis and surrounding area since graduation, both in mixed animal medicine (pets and farm animals) and emergency small animal medicine and surgery. She has lived in Corvallis since 1984, on the same piece of property where the clinic is now located. Her first job in this town was at Anderson’s Sporting Goods where she was in charge of the backpacking/mountaineering department. She worked there for 3 years prior to obtaining a job at the Corvallis Fire department as a Firefighter/ Paramedic. She worked at CFD for 6 years before finally pursuing her passion in veterinary medicine. Her current animal family consists of two horses, a pony, several cats and a dog. Dr. Justin Vaughn joined our medical team as an Associate Veterinarian in 2014. Originally from Hamilton, Montana, Dr. Vaughn attended the University of Idaho and graduated with his bachelor’s degree in molecular biology and biochemistry in 1999. He then went on to earn his Doctorate of Veterinary Medicine from the College of Veterinary Medicine & Biomedical Sciences at Colorado State University where he graduated in 2003. After graduation, he worked three years in a mixed animal practice on the Oregon Coast. Wanting to follow his interest in emergency medicine he accepted a position as an emergency veterinarian. However, he began to miss the bond a general practitioner forms with his clients and their pets. So, after 6 years in the emergency realm, he returned to day practice and has been there ever since. Dr. Vaughn is a member of the Veterinary Emergency and Critical Care Society, American Veterinary Medical Association, and the Oregon Veterinary Medical Association. His professional interests include emergency medicine, soft tissue surgery, and geriatric medicine. His hobbies include fishing, SCUBA diving, cooking, gardening, and doing just about anything that gets him outdoors. At home, Dr. Vaughn enjoys spending time with his wife Cassie, daughter Piper, son Logan, two dogs, Carter and Theo, and his cat, Kitten Kat. Dr. Jessica Bailes is or iginally from Grants Pass. She grew up surrounded by animals and always knew she wanted to work with them. After obtaining her undergraduate degree in zoology at OSU in 2001, she then went on to graduate from OSU College of Veterinary Medicine in 2006 with honors. Since graduation, she has worked as a small animal veterinarian in Redmond, Washington, Silver Lake, Washington, Salem, Oregon and finally Corvallis. She has called Corvallis home for the last 6 years and plans on raising her children and loving life here for many more years to come. Dr. Bailes professional interests involve diagnostic ultrasound , emergency medicine, internal medicine and geriatrics. Her personal interests are gardening, hiking, camping, cooking and above all spending time with her husband Jace, two boys Iain and Graham, dog Walter, cat Clark and several chickens. Cindy is our practice manager. Cindy’s smiling face joined the ACGS team in 2016 after spending over 11 years managing a practice in Eugene. 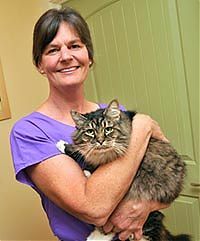 She comes with well over 20 years of passion and experience in the veterinary field. When her former doctor retired she decided to end the hours of commuting every day. Cindy is a lifetime resident of the Albany/Corvallis area and is excited to be working back in Corvallis. When not at work she spends her time running half marathons, collecting art, attending concerts, hiking, creating complex cuisine, and exploring new restaurants and breweries. Cindy loves to spend time with her French Bulldog Flash, who also loves fine dining and breweries, the Persians, Sir Franklin Fig & Leela as well as her persnickety, retired clinic cat Mabel. Bobbi was born and raised in Oregon near Newport and came to Corvallis in 1997 to attend college. She fell in love with the valley and never left. She has been working as a Veterinary Technician for several years and has loved every minute of it. Caring for animals has been a lifelong passion of hers. Bobbi spends most of her spare time riding her horses and enjoys doing some horse and dog rescue work as well. 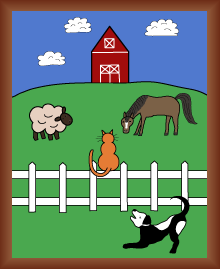 Bobbi’s 4-legged family consists of four horses, two dogs and three cats. Through her rescue work she takes in a lot of foster animals so from time to time you can find other critters in her barn as well such as lambs, donkeys, chickens, etc. Ali is a Pactific Northwesterner born and bred. Although born in Washington, she moved to the Willamette Valley at age 10 and hasn’t left since! After graduating from OSU with a Vocal Performance Degree in Opera, Ali illogically (but luckily!) found the job she always wanted when she began working at All Creatures Great and Small. She is currently taking classes and working toward becoming a certified Veterinary Technician. Having owned everything from Goldfish to Great Danes (and most things in between…), she loves all shapes and sizes of animals and plans to rescue as many as she can in her lifetime. Her current rescues include a “boxador” named Booth and a handsome black cat, Fezzik. Leslie is originally from Virginia but has been proud to call the Pacific Northwest her home for the last 10 years. She joined the ACGS team in January 2016. She spent her first few “adult” years as a music educator upon Graduation from Marshall University (Go Herd!) but it was after she moved to Oregon that she found her true passion: working with animals. 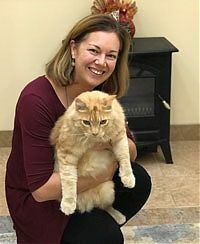 She has worked in the veterinary field since 2009, including several years in emergency medicine, and is thrilled to continue her journey at All Creatures Great & Small Veterinary Clinic. Leslie shares her home in Corvallis with her fiancé Jason and her four cats Stinky, Xander, Cordelia & Willow. In her spare time she enjoys gardening, reading and dining out at fun, new places! Amanda joined the ACGS team in February of 2016. Originally from Virginia, Amanda has been a lover and advocate of animals since she was a little girl. As a young adult she moved to Canyon, Texas, to pursue her dreams of “living out west” and worked doing guided horseback rides thru the Palo Duro Canyon. Amanda moved from Texas to Oregon in 2006 and joined the world of veterinary medicine in 2009 started in emergency medicine and then for a mixed animal practice which included equine surgery and anesthesia. In her free time she enjoys camping, horseback riding, fishing, working on her small farm and most importantly spending time with her family, which consists of her husband Justin, two stepsons, four horses, four dogs and four cats. Although born in Southern California, Austin has lived the majority of his life growing up in the Pacific Northwest. Last year, Austin left his hometown of Washington State to attend college at Oregon State University. Austin is currently in his second year of his undergraduate at OSU, working towards achieving a major in biology and a minor in general mathematics. Austin has plans of attending veterinary school after his undergraduate in which he will eventually pursue a career in Equine Anesthesiology. In his spare time, Austin enjoys caring for his horse, Devy. Austin and Devy compete in a sport known as 3-Day Eventing. Additionally, Austin finds joy in cooking, baking desserts, running, and even cleaning. Alise was raised in a little town on the Oregon coast, she moved to the area with her boyfriend Jeff, to continue her education and experience in veterinary medicine. She spends most her time hiking in the woods and touring breweries with her 3 dogs; Joby, Ryker, and Tallula. She has always had a strong passion for animals and hopes to one day open her own dog boarding facility, as well as fostering senior dogs. Jessica was born and raised in Philomath, Oregon and has spent her whole life loving animals. After high school she went to LBCC to pursue her life long dream of working with animals by becoming a Certified Veterinary Assistant, and she is thrilled to be working at All Creatures Great and Small. Jessica currently lives in Albany with her boyfriend Tanner and their dog Diesel. In her free time she enjoys riding four-wheelers, hunting, fishing, and spending time with her family. Sophie is originally from Portland but has been happily living in Corvallis since 2013 with her husband and feline roomate, MoneyPenny. Sophie orginally studied marketing and communications in college but switched to a focus in animal science instead after her first year. She graduated from Sanford Brown with an associates in Veterinary Technology in 2013 and Sophie has been working as a Certified Techncian since 2014. Sophie started at All Creatures Great and Small in September of 2016 and considers it an encouarging and unquie environment to work in. On her off days Sophie still enjoys playing around with new media and design and also finding a good cup of coffee. Vladimir is our “greeter!” Vladimir was a stray kitty that needed a home. I took him in when I opened the equine boarding facility in 2006. He was going to be my barn kitty and catch mice. However he really never wanted to leave the tack room and I never did see him with a mouse. When the vet clinic was being built, he decided to leave the barn and claim the reception desk as his own, even before the walls were finished! I don’t think he has ever left his spot atop our reception desk, thus fullfilling his job as our greeter! He always makes himself available to pet, unless his hunger pains overcome him in which case he has clocked out and is waiting at his food bowl. (seen here, multitasking, keeping an eye on Vladi and the front counter at the same time…) Sunshine and Autumn are the “chief mousers”. You will see Sunshine, the big orange kitty, in and out of the clinic all day, letting us know just how hard he has been working in the fields. Occasionally he will come in and take a nap…such hard work out there catching all the field mice!!!! Both Sunshine and Autumn arrived on the property 1 day after Vlaidmir (I thought he needed some company). Both were only 4 months old and at first Vladimir hated them! But after only 1 week, he was actually letting them nurse on him in order to keep them out of trouble! Autumn is the big calico who has taken on the job that Vladimir left when he started work at the clinic. She keeps the hay and tack room clear of mice and catches them before they run under the stalls and scare the horses! Leon is the “bug getter”. Any bug that makes its way under the doors are arrested in their tracks. He also loves a shoulder, so if you are having a bad day, he will happily crawl on your shoulder and rub his face on your neck. He came into our clinic 2 years ago as a tiny kitten. He had a rough start to life with his eyes stuck shut. For the first 2 months of his life he was blind, but after several surgeries, he is able to see fine, but his tear ducts don’t work, so he has chronic discharge around his eyes and sneezes alot!! The other kitties accepted him, so he was eventually given a permanent home at the clinic.